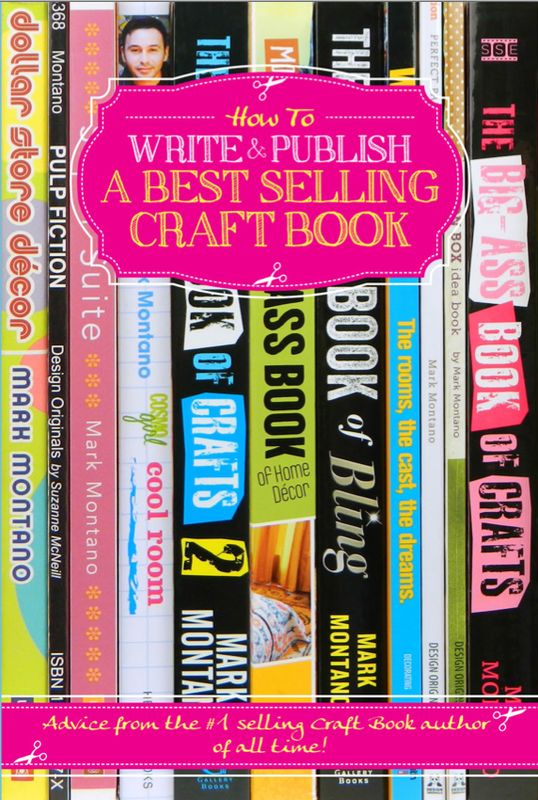 Mark Montano is definitely the right person to write How to Write & Publish a Best-Selling Craft Book. An author and TV personality with 11 DIY/craft books, one of which is in its 12th printing, is exactly who I want coaching me as I prepare my own craft book to hopefully become a best-seller next fall (but more on that later!). As soon as I heard about this new ebook, I couldn't wait to dig into it! Mark gives you the steps for thinking about what kind of craft book you want to write, mapping it out and preparing your pitch to publishers or agents. He also gives great advice on what you need to be ready to do once you get a book deal...including the process of putting the manuscript together and all the self-promotion work you need to do. He doesn't sugar-coat it - it's loads of hard work, but he gives lots of his own "trade secrets" for how he did it to help you. He really is the perfect coach for this topic. Everything's written in Mark's personal voice with his (!!!) enthusiasm, a supportive tone and casual, humorous banter. I could totally hear him cheering me on as I read. If you think you want to write a craft book, definitely buy Mark's ebook first. It costs no more than a buffet lunch and you'll get a smorgasbord of valuable insider tips and expert advice. This was my first try at Kumihimo, a traditional Japanese form of making braids. Armed with a Kumihimo how-to video and plenty of supplies from my friends at Prima Bead, I really wasn't sure at first if I would enjoy it, since I'm not a knitter-weaver-stitchcounter type. But I am happy to report it was fun, easy and even somewhat meditative. I highly recommend watching the video to learn the basics, rather than trying to learn from reading the package instructions. Once you have your cords loaded on the slotted foam disk, it's just three basic steps that you repeat over and over until the cords are braided together: right cord down, left cord up, turn the disk. I used one of my crystals as a weight, it really helps keep the braid taut as you are working. For the white bracelet, I used four double strands of cord. I love how the braid looks like thick rope, but so much prettier, especially with that silver thread in there. For the blue bracelet, I used four single strands of cord, which ended up being the perfect thickness for the large-hole Trinkettes beads; they pretty much stay right where you put them in the center of the braid. I added some large-hole sterling beads as spacers. Add some heavy-duty glue and some finishing findings...and not too bad for my first try! You can also add seed beads into the process, but I really like the look of the braids by themselves, especially with colorful, sparkly cording. Now that I've mastered the bracelet, I'm off to try a longer braid for a necklace. For more Kumihimo projects, check out what these talented designers made this month too! I made my duct tape feather and it will be part of history (tee hee)! The Charity Wings Art Center in San Diego is teaming up with Westcott, Duck Tape, and Velcro to host a big Labor Day event - they're going to make the world's largest wings out of duct tape. Even if you can't be there in person, you can make a duct tape feather (or lots!) and mail it in to the Art Center to be part of the fun - click here for all the details. I really don't know why I like this funny little project so much, but I just do...it's a mini tripod pedestal wrapped in washi tape to display my business cards on my desk. Our challenge this month for the Designer Crafts Connection was to make a craft using school supplies. As you can probably guess, the legs of my mini tripod pedestal are just good ol' #2 pencils, with the erasers pulled off. I was inspired by a recent blog post I saw on Craft Foxes, where they highlighted a bunch of cute washi tape crafts. I covered a Smoothfoam block and all three pencils with washi tape, poked the pencils into position and done! Click here for complete instructions. This project could not have been quicker or easier to make, and I really love the bright colors. Click on the Designer Crafts Connection logo in my sidebar to hop through lots more designers' blogs who have made something cool with school supplies! My good friend Marisa Pawelko has a new book - Crazy Cool Duct Tape Projects - and it's FUN! I hadn't quite gotten into the whole duct tape craze yet, but her book definitely inspired me to give it a whirl. There are so many really great colors and patterns of duct tape and sheets now! I was rather conservative though; I just bought a roll of black. Marisa's book has lots of tips and nice, clearly-written instructions for 24 super creative projects, including wearables, fashion accessories and home décor...she even created a "geek chic" pocket protector - love it! Now personally, I can't quite pull off the bright colors and patterns like our dear Modern Surrealist Marisa can...I lean toward wearing the aforementioned black. I made this black duct tape bracelet cuff and it was really quick and easy - I love it! I had these cute silver keyhole studs that have been patiently waiting for the perfect project - and I really like the contrast of the cloth gaffer tape that I put along the center of the cuff. A stainless steel magnetic clasp makes it super easy to put on and take off. Click here for my project instructions. Marisa's publisher was kind enough to send me a copy of the book, which I would love to give you all a chance to win - you're gonna love it! Enter below and good luck!